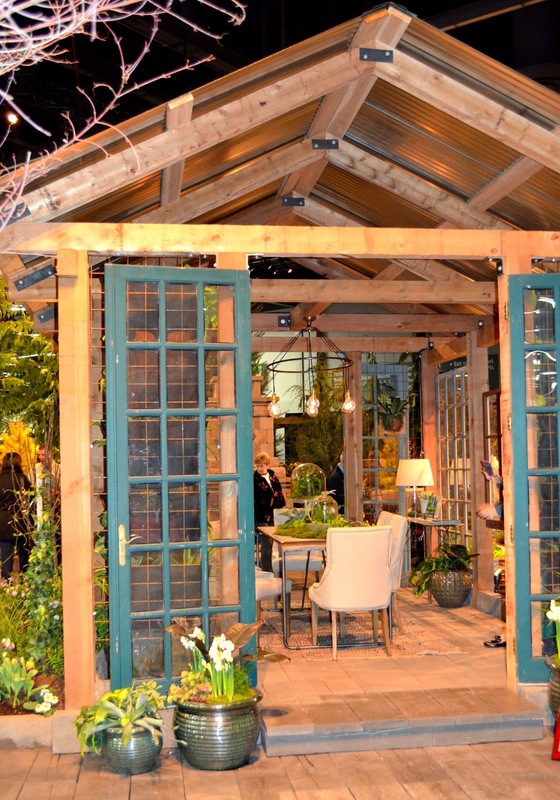 The Portland Yard Garden and Patio show took place last weekend. 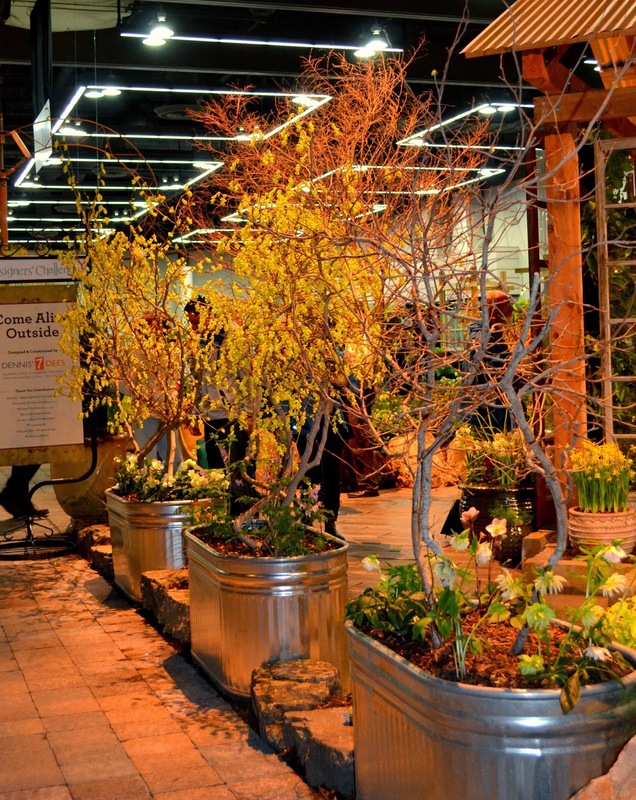 Outside it was cold and dreary but inside the Portland Convention center, the atmosphere was festive with an emphasis on intimate entertaining spaces, edible gardens and creative solutions for problem garden spots. 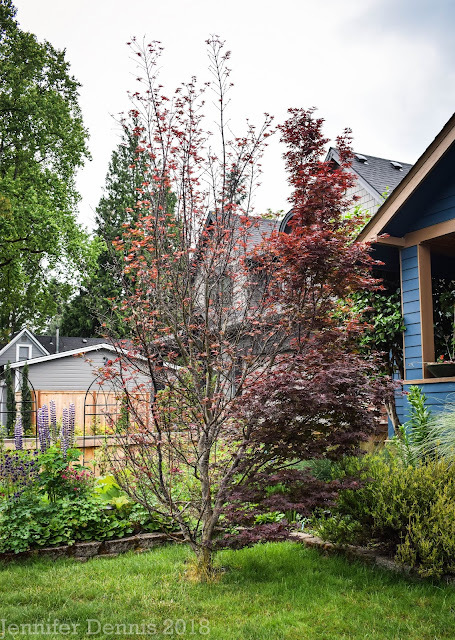 Jennifer Bayer Garden Design, Inc and Showscapes Inc. created a kitchen garden that bordered a beautifully designed eating / entertaining area, complete with chicken coop, mason bee's and fire pit. 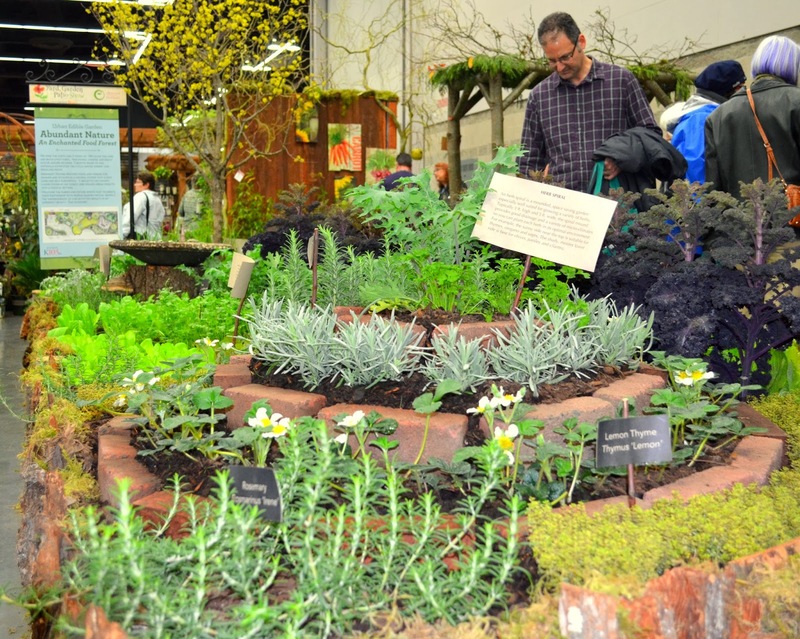 I loved this design it was called 'A Bountiful Feast..Trowel to Table. My favorite of the Design Challenge's. Garden Shed with seedlings ready to be planted. I'd happily transport this to my own yard. The Urban Edible Garden was great fun and inspiring as usual. This is my favorite overall display in the show. 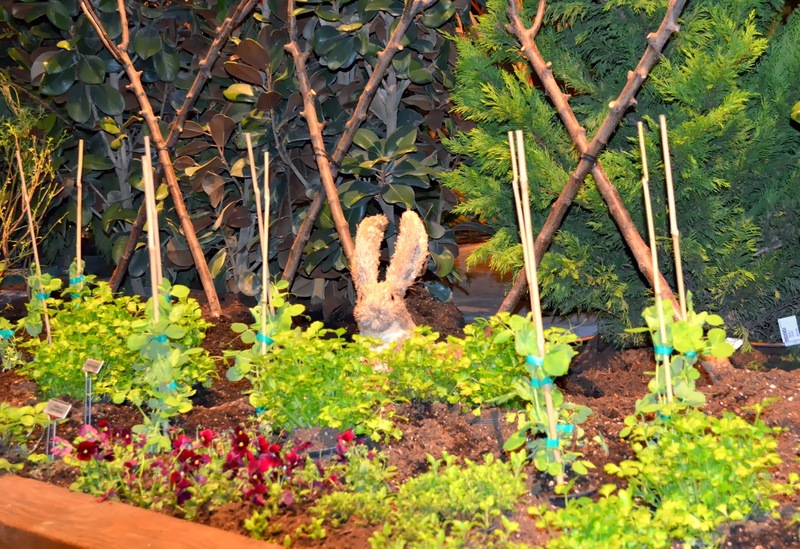 I loved the use of the woodland theme while incorporating edibles into the landscape. 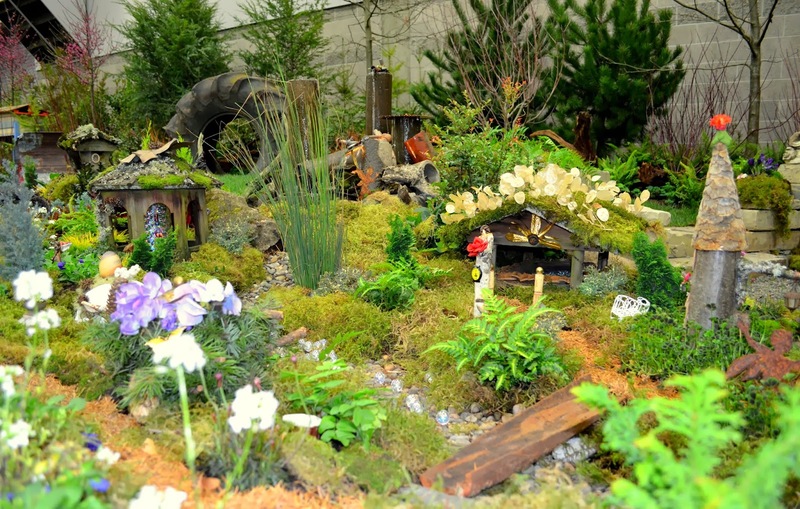 Add to that tiny fairy gardens and play space for kids and you have a potentially in-reach idea for urban gardening families. I also applaud the down-to-earth nature of this display. When I listened to the conversations that were taking place around me at this display, it was of people feeling like the elements of this display were in reach. I love that. 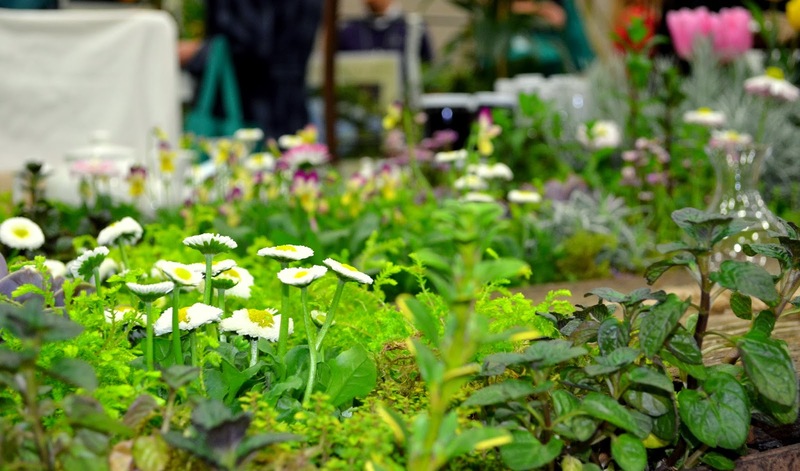 The display showcased bee's, native plants and edible gardening. Urban Edible Garden 'Abundant Nature An Enchanted Food Forest' showing a tiered garden with fruits, herbs and spring veggies. 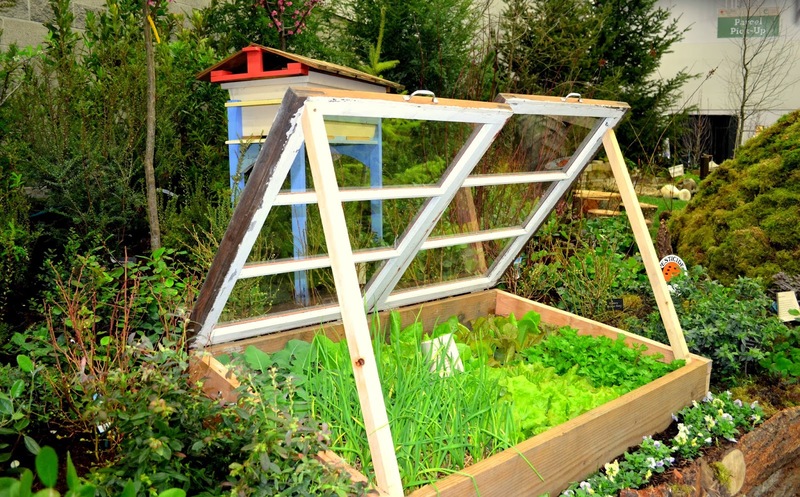 Cold frame made from recycled windows at the Urban Edible Garden display. This looks like a great DIY project. Baumans had a fun display on the backside of their booth. 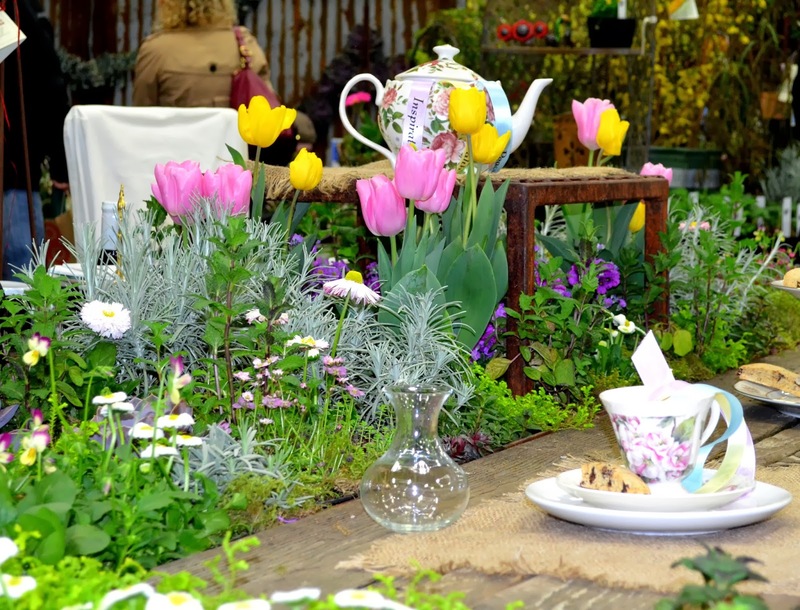 It featured an English Cottage theme of pretty blooms with a farm table complete with tea service and live plants growing on the tables borders. Edible Table Top from Baumans Display. Can you imagine plucking herbs to season your meal from your dining seat? 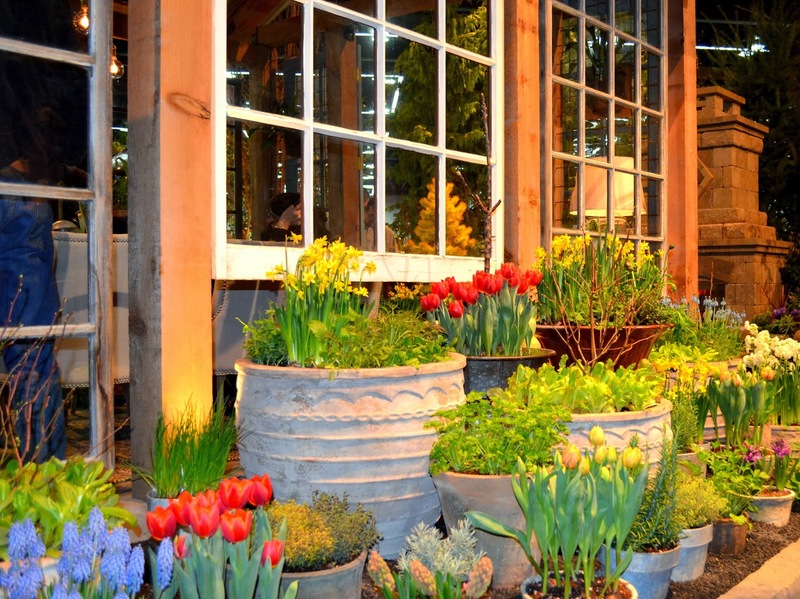 Exterior of entertaining structure featured a pretty menagerie of pots and spring blooming plants. 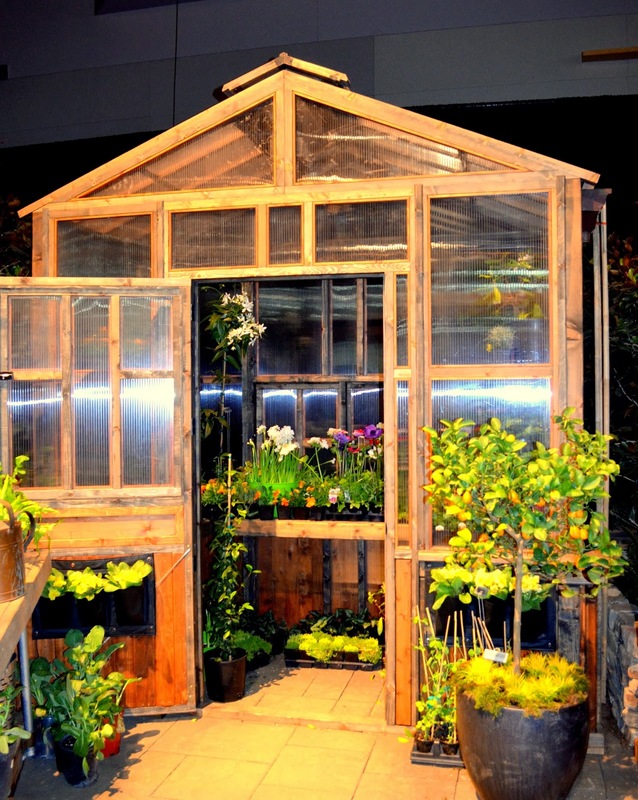 The windows were semi-attached to the structure and made with reclaimed windows. Kinda cool! 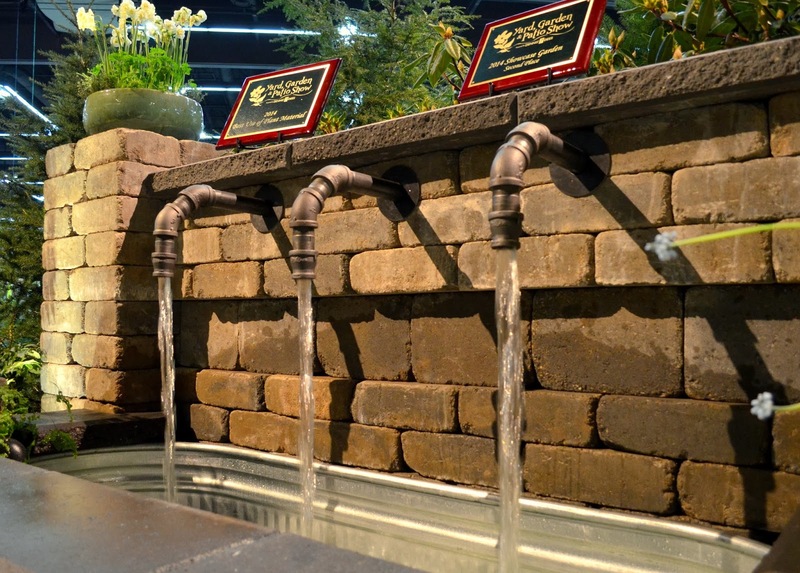 Popular this year is the use of pipe fittings to create a custom fountain. Dennis 7 Dee's used several stainless steel troughs in their design challenge this year giving it farm charm. More use of the stainless steel troughs, this time as both a raised garden and borders. The displays I enjoy the most showcase edible gardening. For me, it's an important idea to demonstrate and build excitement around. Don't get me wrong, I drool over the fabulous ornamental displays, hardscape ideas and original structures, but what I truly get excited about is seeing new or potentially new gardeners get the idea that they CAN grow some of their own food and incorporate those edibles into their existing landscape. Overall, my day at the show was fun as it was spent in good company. The best part of the show are the seminars. I was able to take in Richie Steffen's discussion on 'Ferns for the Northwest.' Who knew you could take pages full of notes on ferns. Great seminar! 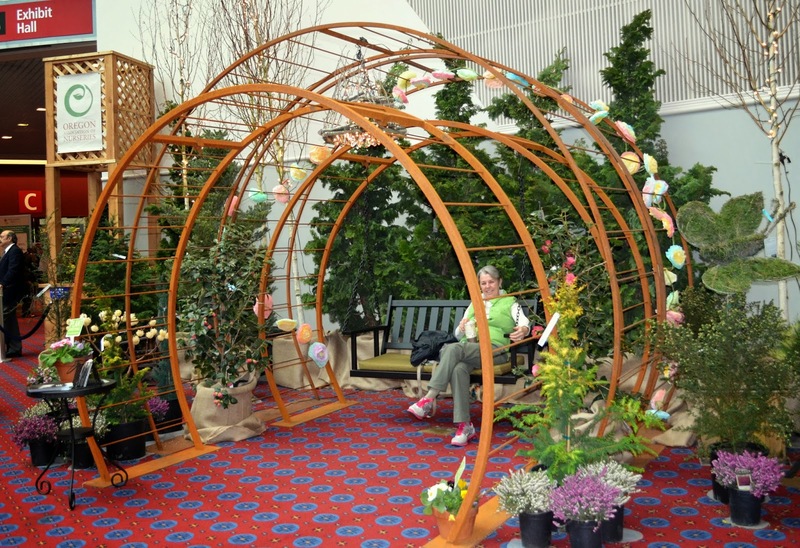 Below are links to some of my fellow garden bloggers perspectives on this year's Portland Yard Garden & Patio Show. It's always fun to see what everyone takes away from the show. Now that the show has come and gone, it really is Spring and time to get digging in the garden. Thanks for including a link to my post! 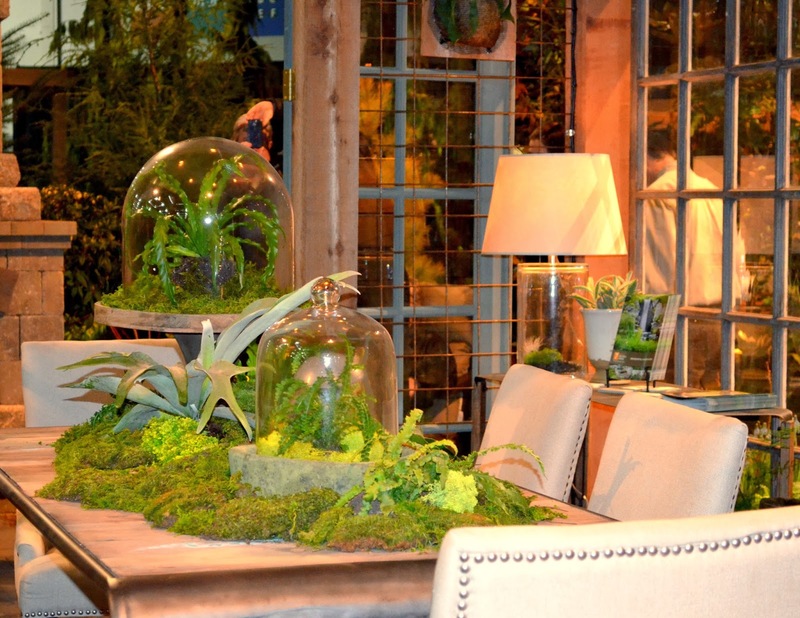 I loved the moss-covered table but I think I'd prefer it as an ornament in the garden somewhere. It's less than functional as a dining surface with all the moss and terrariums on it. Jennifer, what a lovely virtual tour of the show. I love the little tea cups in the English garden. I'm getting so anxious for spring now, I know everyone is! Planted tables everywhere...these designers must be talking to each other behind our backs. I did like them, but they would need to be modified a bit to be practical for a real dining experience. Thanks for sharing your take on the show. Sorry you couldn't make it to the Saturday lunch, but we can't have everything. Glad you enjoyed the show. You were picking up exactly what I was putting down. 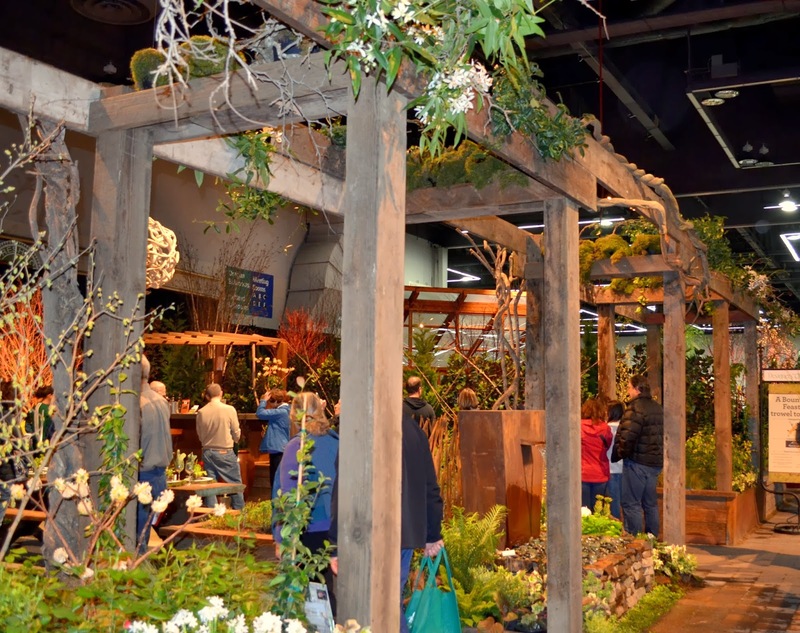 Thanks for the shout out of Red Bird Restorative Gardens Tea (hee-hee) Table & planting design featured in Bauman's / Monrovia's booth! Fingertip (accessible!) gardening that restores the soul (and palette) - that interaction with nature right at the table - had many folks picking and pinching those tea-based herbs and flowers. Your table was the favorite of my neighbor who loves all things English Cottage. Seems you hit a home run for many folks. Well done! Big bouquet of thanks Jennifer! Oh my goodness, that's just so beautiful...nothing like that happening up here, that's for sure. This show was a lot of fun! I too enjoyed good company that day but the day would have been even more wonderful if I had seen you as well!